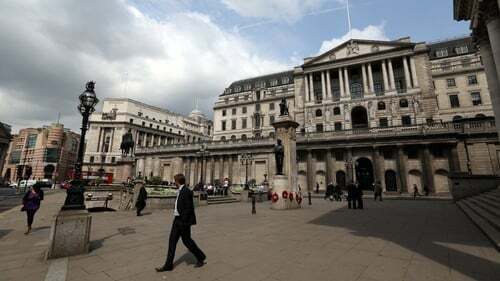 The Bank of England kept UK interest rates steady today and said most businesses felt as ready as they could be for a no-deal Brexit that would likely hammer economic growth and jobs. The Bank of England said its nine rate-setters voted unanimously to keep interest rates on hold at 0.75% today. The decision came just days before the world's fifth-biggest economy could leave the European Union without a deal to smooth its way. "The economic outlook will continue to depend significantly on the nature and timing of EU withdrawal," the Bank of England said. The bank again said rates could move in either direction if there is a no-deal Brexit, as a sharp fall in the value of the pound could generate inflation pressure in addition to the broader economic shock. Separately, the Bank of England published a survey of just under 300 companies that showed around 80% feel they are "ready" for a no-deal, no-transition Brexit - up from 50% in January. Many companies reported that there were "limits to the degree of readiness" that were possible in advance of a possible no-deal scenario, the Bank of England said. "Indeed, the March survey also showed that respondents - even those that felt 'ready' - still expected output, employment and investment over the next 12 months to be significantly weaker under a 'no deal, no transition' Brexit," the bank said. The minutes from the March meeting of the bank's Monetary Policy Committee (MPC) showed little change in tone since it published its latest economic outlook in February. "The news in economic data has been mixed, but the MPC's February projections appear on track," the minutes said. "The broad-based softening in global GDP and trade growth has continued. Global financial conditions have eased, in part supported by announcements of more accommodative policies in some major economies," they added. The US Federal Reserve last night brought its three-year drive to tighten monetary policy to an abrupt end, abandoning projections for any interest rate hikes this year amid signs of an economic slowdown. Last August the Bank of England raised rates for only the second time since before the global financial crisis. Today it stuck to plans for a further gradual increases in borrowing costs, but only once it has a clearer idea of what Brexit will mean for the world's fifth-biggest economy. Private-sector business surveys suggest the UK economy has slowed sharply in the run-up to Brexit and as the world economy lost momentum. Inflation in Britain is running just below the Bank of England's 2% target but pay growth is running at its highest level in more than 10 years. The Bank of England said signs of strength in inflation pressure in the labour market were "notable".